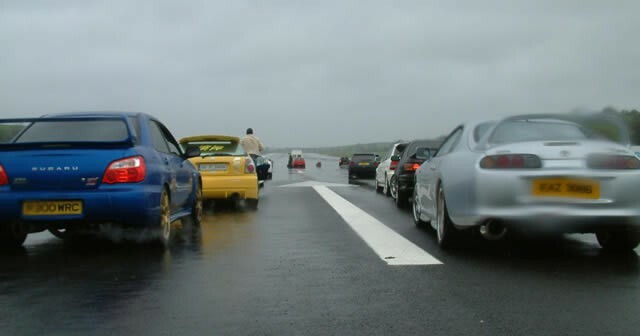 After the success of the previous drag strip event held at St. Angelo’s airport in Enniskillen, it was only a matter of time before a repeat event was held. This time, headed by AJS Promotions it was much more focused affair. There was a notable lack of display/show stands and the emphasis was squarely on performance cars. The main attraction of the day was the quarter mile strip utilising the runway. This was set up in the usual manner with two-car runs, timing gear and selective grouping so that the cars were fairly matched. Upon our arrival, the racing had already started. 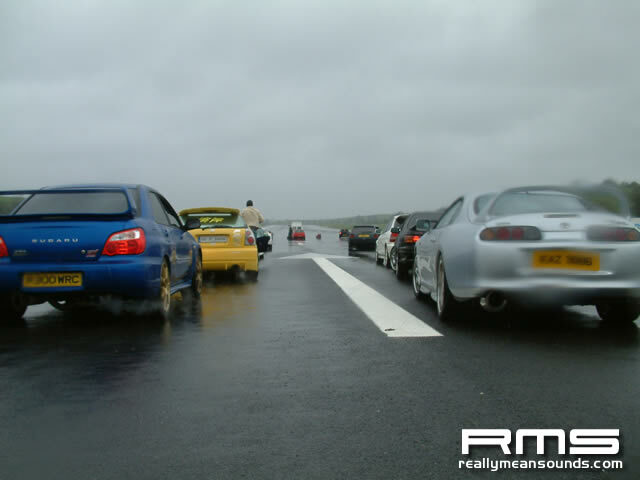 Most of the first batch of cars were front wheel drive and in the sub two-litre class – Honda Integra Type-Rs, Civics, Hyundai Coupés etc. However it was immediately apparent that the atrocious weather was having a severe effect on the racing. There was much wheel spin off the line and the spray from the cars even made spectating difficult. Although there was a strong and varied line up of entrants, the rain had had an averse affect on the number of spectators; a shame that a venue with such a large potential for capacity appeared almost empty. To provide a break from the drag racing, AJS Promotions had also arranged a number of smaller attractions. <a href=”//www.steerfromtherear.co.uk”>Steer from the Rear</a> were present as always and the sight of their three Nissans performing wide drifts and shooting flames brightened up what was an otherwise dull day. Paul Conlan from SFTR also showed what a Porsche 911 (996) Turbo is capable of in the right hands. The other highlight of the day was <a href=”//www.fireforce.co.uk”>Fireforce 1</a>, the jet powered drag car. A lot of the crowd were patiently enduring the terrible weather just to see this 200mph spectacle. As the Fireforce 1 team performed their final checks, the jet engine was ignited a number of times creating a noise not unlike a sonic boom. With our ears buzzing, Fireforce 1 accelerated like a bullet up the track…….. only to immediately vent smoke, lose traction and veer off the strip at high speed. As it crossed the strip the removable shell of the car flew loose and debris was strewn across the track. Emergency teams immediately rushed up the strip but it was a relief to see the driver stepping across the track and waving to everyone to show he was OK.
At this point it was now uncertain that the event could continue given the situation. We suspected that the timing gear at the far end of the strip had been destroyed by the crash. With their spirits already dampened by the weather, many spectators and entrants began to leave and it looked like the day was drawing to a premature end.